Back then - Tonka meant quality. If you had a Tonka truck EVERBODY wanted to play with it. My friend had a Tonka garbage truck when we were growing up. That thing took some kind of abuse and never broke. 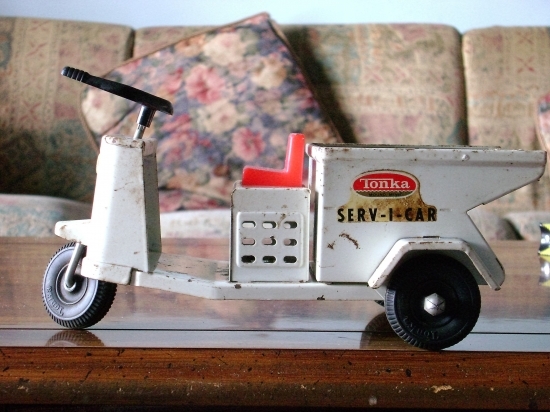 I've had one Tonka toy since I was 7, 52 years ago. It's called a Servi-car. It's basically an early 60's Cushman type 3 wheel vehicle with handle-bars for steering. About 20 years ago, I had a garage sale, and a guy that owned a retro toy store stopped in and bought a bunch of my old toys. I had some of the old Aurora monster models, some even missing parts, and he gave me $10.00 each for them. Then he spotted the little tonka truck and without missing a beat he offered me $65.00 for it. He did it so quickly, I said no, he chuckled and admitted he had jumped a little quick on it. He told me he'd seen a few of them, but mine had all the little pieces; handle - bars, decals, and the little plastic head light. He told me then, that I should never take less than $110.00 for it. Still have it today in the same condition. It's been a long time..since I've seen an ad promoting "Tonka Toys".